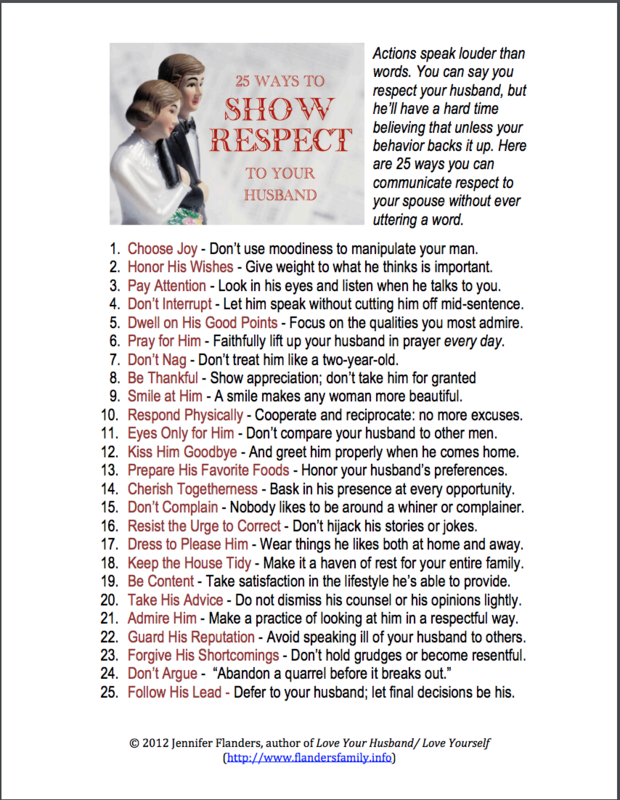 My blog traffic at our sister site, Loving Life at Home, has skyrocketed since I posted 25 Ways to Communicate Respect a few days ago. It evidently struck a chord! 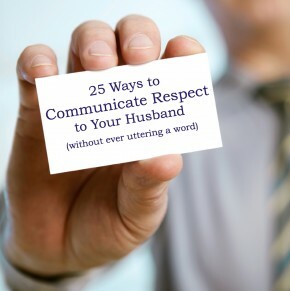 How Does Your Husband Spell Respect? Blessings on your marriage! Enjoy! Jennifer….thank you so much for writing this…it is exactly what I needed to read….I have spent most of our 21 years of marriage being critical of my husband, disrepectful in my words and thoughts, always trying to change him into who I thought he should be and just miserable to live with…..but due to a wake up call…3 weeks ago God changed my heart toward my husband….I began to see him through God’s eyes and not my own…I began to feel a love for him that, to be honest, I can’t remember feeling….I am in love with him, I want to please him, I want to be his best friend and I want to show him my love for him through respect that he and our children have never seen from me…..I don’t know if loving him in this new way (God’s way, not mine) will stop us from going down the path we seem to be now headed…but I know now I need to love my husband as God intented me to ….not to just restore my marraige, but to show our children (20,18 and 16)how a Godly wife should act toward her husband…..
You’re right, Natalie. It does sound extreme when you word it like that… but it sure beats the opposite extreme of relegating your physical relationship with your husband to the rock bottom of your to-do list so that his desire for intimacy is routinely neglected, ignored, or marginalized. I stand by my original advice. Let excuses be a rare exception rather than the rule. Give it a try and you may find that this advice is much more delightful than you imagine. Thank you for this “list”. But I prefer to think of it as the pathway to a God-honoring, fulfilling marriage. It’s a journey that takes wisdom and patience because neither of us is lovable all the time! We’ve been married 30 years, and I know that each of these ways works! Marriage is not 50/50 but 100/100. I promised to do what is best for him (in other words, to love him) – I’m still learning, which makes this journey an adventure of which I am so thankful to God to be a part!